Where many marketing books are huge and complex, Danny Brown in Why Simple Works, contends that they don’t have to be. He tells us to forget focus groups and some complex survey system when we’re looking to improve our products. Ask our sales people what the biggest technical hurdles to purchase are and fix those. Leaders — true leaders — don’t just lead; they’re led as well. Instead of just ordering the direction of your company, listen to those around you. Your frontline people have the best connection to your customers, so dig in with what they have to say about the products and services you offer. If you’re not willing to listen to your frontline people, then why would you really listen to your customers? You’ve already discounted the direct line you have to them. Brown also reminds us that our companies are not all about numbers. These companies are about people and connections. In my life, this reminded me most of my connection with Chris Lema. This connection formed years ago as we exchanged a few emails. It continued as we met at a few conferences and spent some time talking. It’s continuing as he recommended me as a writer for Liquid Web. The bridge was built and continued to be built as we saw each other interact with the community and it has turned into an income stream for me, and content for his team at Liquid Web. Yes this is a short review, because Danny Brown keeps, Why Simple Works, short and simple. There is no fluff in the book at all. 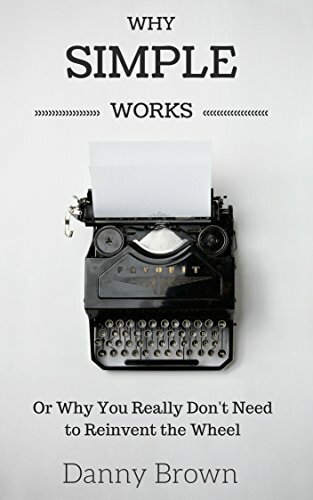 This is not a one size fits all book with some big marketing plan, he specifically denounces those, but it is a short read that can help you see the need to do the simple stuff. Maybe your business is on hold right now, because you’re making it all way too hard. If you’re up for a short inspirational read on marketing, then Why Simple Works fits that profile. This is a short book about keeping your marketing simple.